It’s been a good day, but a busy one. First of all, I somehow managed to cram 8 hours of work into half the time this morning because I had to leave at 11:30 AM. My running buddy and I were going to pick up our Long Beach Marathon race packets at lunchtime and I had a work deadline fast approaching. Fortunately I got almost everything important done before departing. 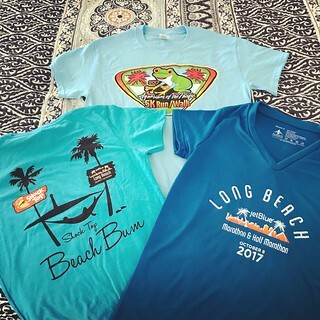 Getting the bibs, shirts, and other necessary items for the Aquarium of the Pacific 5K tomorrow and the Long Beach Marathon on Sunday went smoothly. As you can see from the above photo, I got three new running-related shirts today. Not that I need more shirts, but I’ll still wear them! (Well, maybe not the unisex one from the 5K, but I haven’t decided yet.) I had to go back to work after picking up all my race stuff, but only for an hour. I still had most of the afternoon off. Due to the fact that I don’t want to exhaust myself tomorrow trying to cook all of next week’s lunches and dinners when I should be resting before the marathon I decided to get started today. After a trip to the grocery store (one of many this past week – Whole30 requires more produce than I ever imagined) I went home and began preparations for several dishes I want to cook tomorrow. I’ll share more about that tomorrow. Right now I’m drained and I just want to go to bed. Today’s notes: Lunch was late today (3 PM) so my mid-morning snack was basically a double serving. As far as everything else goes, I am perfectly aware that my meals are getting really boring. As delicious as everything is, I’m getting tired of eating (and writing about) the same things over and over again. But don’t worry, I will have lots of new things on my menu next week. I have some great stuff queued up to cook this weekend. And besides that, the next two days are going to be a bit of a roller coaster. Buckle up, because these will be Whole30 days like no other! Day 5 – Whole30 not for runners? Today I realized that either Whole30 is not for runners or I’m not eating enough compliant carbs. My training runs this week have not been stellar, which I initially attributed to just having a bad day or two. But when I got really fatigued running only 5 miles tonight I finally realized that my lower carb diet might be causing my difficulties. I plan to increase my fruit consumption from now on, and include potatoes in more of my meals to see if that makes a difference. That will probably help on a daily basis. However, this Sunday is the Long Beach Marathon. There is no way I’m crossing that start line with so little energy and 26.2 miles to run. I’ve always planned to have a nice plate of pasta for dinner on Saturday night in preparation for the marathon, but I might take it a little farther. A McDonald’s Sausage Egg McMuffin might be on the menu for breakfast too. I don’t want to go overboard and negate all of the progress I’ve made over the last 5 days, but I am certain I can’t run a marathon on my current diet. I’m certainly healthier after 5 days of Whole30, and I think I’m even slightly slimmer, but long distance running required more carbs! Speaking of fatigue, I’m going to bed now. Maybe one day I’ll get around to writing about my Whole30 lunches, but it’s not going to be today. Today’s notes: Last time with the confession about the teriyaki ground beef in my lunch. It was the last serving I had in the fridge and now it’s gone. But don’t worry, I’m sure I’ll find other Whole30 cheats in my diet to talk about. And as I said on Tuesday, the tomato soup has a little flour in it for thickening. Obviously I need more variety in my diet because these notes are getting repetitive. Finally, I’m not sure Larabars are technically acceptable on Whole30, but with only dates and cashews in the ingredients list I’m allowing it. I needed something sweet after dinner to close out the day. I want to start today’s blog post out with a little story. At a staff meeting this afternoon we had a cake for someone’s work service anniversary. Obviously I’m not allowed to indulge in cake on Whole30, but I figured if it today’s cake happened to be a carrot cake I would grab a piece and save it for the weekend when I have a few cheat meals planned (more on that when the time comes). Turns out it was indeed carrot cake and the smell was intoxicating. I managed to not touch the slice I was given during the meeting, but on my way back to my desk my resolve weakened and I had a couple small bites of frosting. After that I was absolutely certain that if I held on to that cake I would be unable to resist eating the entire slab within five minutes. I weighed my options for a second before coming to the conclusion that I didn’t want to throw out four days of healthy eating for a momentary sugar rush. Not worth it. So I did the sensible, if wasteful, thing and threw the piece of cake in the trash. Now I call that a real Whole30 win! I’m putting off the discussion of my Whole30 lunches for another day because I’m really tired. I got up at 4:45 AM this morning to walk with some ladies in my running group. We walked for an hour and I was still home before sunrise. Add a full day of work and a 3-mile run tonight on top of that and I’m exhausted! 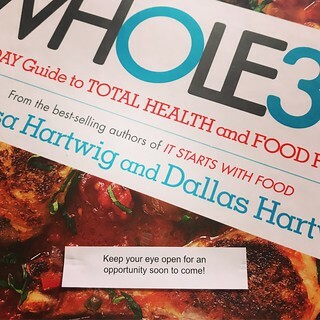 More exciting Whole30-related insight tomorrow! Today’s notes: See Monday’s notes for information on the non-Whole30 nature of my teriyaki ground beef. I have one more serving of it in my fridge so you’ll be reading a similar note again later this week. Also, besides the couple of bites of super sugary frosting I had today before my willpower set in, there was also a little honey in the balsamic vinaigrette dressing on my salad. Like a teaspoon or less. I’m not too worried about that. I was planning to write a post about my Whole30 lunches, but someone from my running group just asked me to go walking with her in the morning. This means an early bedtime and an even earlier wakeup call for me. I’ll regale you with tales of my array of midday lunch choices tomorrow! 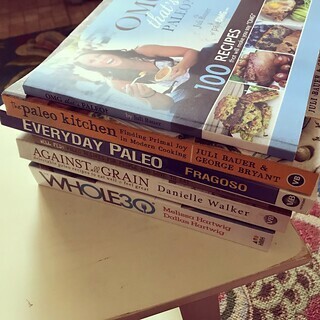 Today’s notes: Yep, more Whole30 cheats. Get used to it. This morning when I grabbed my lunch out of the fridge and saw that it included chicken I thought I had a 100% Whole30 compliant meal for a change. But then I saw that I’d rounded it out with the some leftover peas and corn. I still consider it healthy even though it broke a couple of rules! 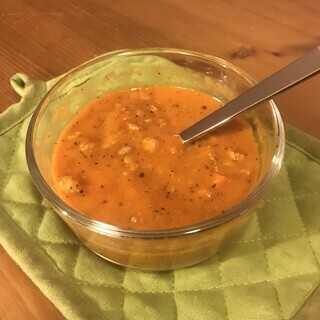 Also, I have to admit that the homemade tomato soup (technically a bisque, but I omitted the half-and-half) I had for dinner has a little bit of flour in it for thickening purposes. If I’d had almond flour when I was cooking this weekend I would have used that instead, but no such luck. However, the homemade Italian sausage I made was perfectly within the Whole30 guidelines, and it was delicious! I’ll be using that recipe again soon. P.S. After three days of Whole30 that banana with almond better tasted like the best thing I’d ever eaten. Breakfast has never been my strong suit. Most mornings during the week I would grab a Slimfast shake, protein shake, or granola bar as I was rushing out the door to get to work. And on the weekends McDonald’s was my go-to morning meal, usually after running with my Galloway group. But since none of those options are available on Whole30 I had to completely rethink my breakfast habits. So yesterday morning instead of my usual pre-race Slimfast shake I ate a banana before the Aloha 5K. I was disappointed to have to miss out on most of the post-race goodies – chocolate milk, Hawaiian rolls, and chips – but I was committed to starting Whole30 off right. Luckily one of the other tables had apples so I did take one of those home with me for later. After I got home it had been hours since I had that banana so I was really hungry. 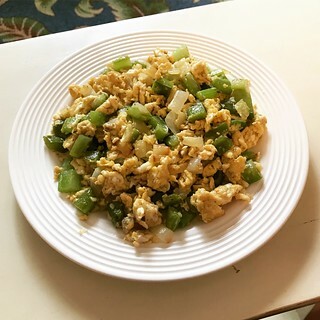 Before I even showered I scrambled three eggs with diced onion, bell pepper, and celery (the leftover vegetables I had in my crisper drawer) and gobbled them up. It was a delicious meal. I’ll confess that I used regular butter rather than ghee to cook the eggs because, 1) I don’t want to make clarified butter myself, and 2) I refuse to spend money on ghee when I have plenty of regular butter in my fridge already. Just another little Whole30 cheat! I’ll probably have a million of them by the time these 30 days are up. This morning was slightly more complicated because it was a weekday. Last night before I went to bed I diced up a ton of vegetables and cooked some Aidell’s chicken apple sausage (surprisingly Whole30 compliant!) so that I could quickly and easily whip up my breakfasts before heading to work each day. As exhausting as it was, all of that prep really paid off because it was a breeze to scramble two eggs with veggies and sausage this morning. Don’t worry, I know I’ll get sick of scrambled eggs really fast, but for now I’m still enjoying them. 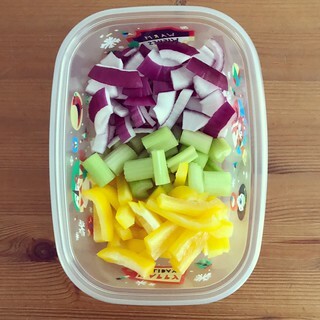 Over the weekend I’ll work on adding more variety to my morning meals. A couple of notes: First, I didn’t have my usual mid-morning snack because I was stuck in meetings until almost 1 PM. That’s why it looks like I had two snacks back-to-back. The apple was eaten while I was still at work and the banana was consumed at home an hour before my boot camp class. Second, the teriyaki ground beef in my lunch contained two Whole30 banned ingredients – soy sauce and honey. Gasp! But, like I said yesterday, I wasn’t about to let perfectly good food go to waste just because I didn’t eat it before October 1st. And third, my dinner also broke several Whole30 rules since beans, corn, and peas are not allowed on the program. 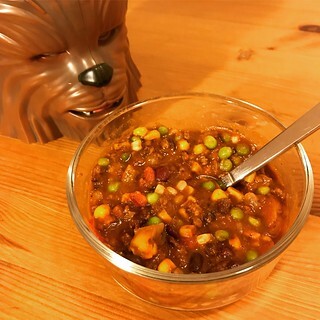 But after somehow avoiding all of the candy in the snack bar at work today I consider a delicious bowl of homemade chili to be a relatively healthy dinner choice. Especially since I’ve been known to eat handfuls of crackers straight out of the box for dinner. I’m kind of establishing my own rules for this challenge and I’m OK with that. *Note that the pre-packaged salad broke the Whole30 rules right out of the gate because it had cheese, dried cranberries, and some dressing that was sweeter than could possible be allowable. I’m not too worried about that, though, because in the end it was still a salad. It’s not like I went out and got a burger and fries or anything. I still call it a win! And I wasn’t about to let it go to waste just because I’d established October 1st as an arbitrary deadline. No salad left behind, I always say.